What did it take to be a paratrooper in World War II? Specialized training, extreme physical fitness, courage, and — until the 555th Parachute Infantry Battalion (the Triple Nickles) was formed — white skin. It is 1943. Americans are overseas fighting World War II to help keep the world safe from Adolf Hitler’s tyranny, safe from injustice, safe from discrimination. Yet right here at home, people with white skin have rights that people with black skin do not. What is courage? What is strength? Perhaps it is being ready to fight for your nation even when your nation isn’t ready to fight for you. Front matter includes a foreword by Ashley Bryan. Back matter includes an author’s note, an appendix, a time line, source notes, a bibliography, and an index. Rich with detail, the pictures not only complement the narrative, but also tell a stirring story of their own, chronicling the triumphs and frustrations of the soldiers as they pursued their dreams. Complete accessibility to a wide range of readers, coupled with expert research and meticulous care, makes this a must-have for any library. An exceptionally well-researched, lovingly crafted and important tribute to unsung American heroes. A captivating look at a small but significant piece of military and civil rights history. Written with great immediacy, clarity, and authority, Stone’s vivid narrative draws readers into the Triple Nickle’s wartime experiences. Many well-chosen quotes enhance the text, while excellent black-and-white illustrations, mainly photos, document both the men of the 555th and racial prejudice on the home front...This handsome volume documents the sometimes harrowing, often frustrating, and ultimately rewarding experiences of the Triple Nickles. This will appeal to readers who like history, adventure, and the military. ... [Stone's] strength as an author is that she makes rereading the text a joy. The book’s focus is wide: there are excellent sections on segregation and stereotypes in American history, Japanese American internment camps, Japanese balloon bombs, the Battle of the Bulge, and Operation Firefly, brought to life with archival photographs and Stone’s always clear prose. Richly illustrated with photographs, this compelling story of the Triple Nickles’ training and Pacific coast mission will be of particular interest to young teens who have read Shelley Pearsall’s Jump into the Sky (BCCB 10/12), and the appended bibliography, timeline, notes, and index will guide their further exploration of these heroes. The well-researched book includes interviews with many of the original paratroopers. ... This would be a good book for use in a study of World War II, a look at the civil rights movement, or a unit on discrimination. 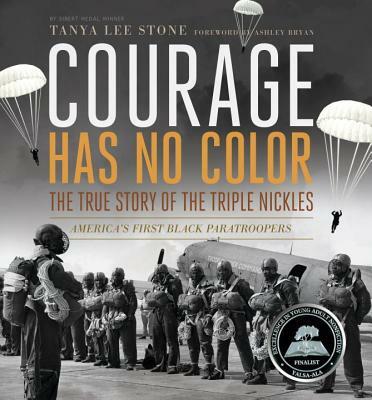 Stone opens her new book with what it felt like to be a paratrooper — the thrill and the fright of jumping out of an airplane, ready for battle… Facing racial intolerance and raging fires, pushing for integration and opportunity, the Triple Nickles make clear that courage has no color but many facets. Stone weaves the story of these brave men and their wartime efforts within the larger story of discrimination within the military and the nation itself...This is outstanding nonfiction and is a real curriculum gem as well as being a deeply compelling reading experience. Through interviews with World War II veterans such as Walter Morris, Tanya Lee Stone's illustrated history tells the little-known story of the Army's 555th Infantry Battalion of black soldiers, who had to fight racism within the military for the right to jump out of planes. A fascinating, thorough and inspiring account. Consider this a fine bit of research and history that deserves praise and honors galore. [A]n inspiring tale that fits into curriculum units on American history, WW2, black history, civil rights history and even a discussion on bullying and racism. ... But this is a book for adults as well. Meticulously researched using primary source material, the story comes alive against the background of segregation, American values vs. Hitler's monstrous acts, and the passions of young American men who were frustrated in demonstrating their loyalty to their country by the color of their skin. Balancing a rich mix of photos and illustrations, Courage is narrative-focused — perfect for introducing inquisitive schoolchildren to America's complicated history with race and the military.